If you are short on time, I would highly recommend this trip. The guide was very good and knowledgeable, stopped off at a few places, explained the history and gave us time to take numerous photos. The Monument Valley Tour was amazing. Our tour guide was friendly and knowledgeable. We really learned a lot in the short time we were there. Definitely worth the long drive to get there. Minimum 2 people, me I was alone, service and guide say me i’ll Receive voucher back, I don’t think so...company not available for your needs, place amazing! This tour went in the same area at the Monument Valley Guided Tour, but went to different places, and the information from the Navajo guide was different. This guide was constantly checking his watch and the 1.5 allotted hours was what we got. My wife forgot her phone in the tour vehicle, possibly because we felt rushed, but she was able to contact someone and he returned with the phone. 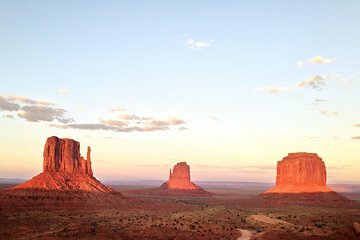 Skip this and enjoy the Monument Valley Guided Tour. Ask for Duffy. It was literally an awesome experience! The tour guide, Harry, shared the story of Navajo during the tour and gave us amazing photo tips! He is also a great photographer. The tour is with a small group. In our case, the participants were only me and my girlfriend. I found it nicer than other tours with the large groups. It is highly recommended and I will definitely join this tour again, hopefully longer hours when I visit here again. Trip was really enjoyable. Our guide, Harry, was very knowledgeable and fun. Our family thorougly enjoyed the tour. Andrea was a fantastic tour guide! Although we only had time for the 1.5 hour tour on this trip, she made the most of it for us! We loved it and would recommend this tour and tour company to all of our friends! Steven was our guide. He was very informative and took the time to explain things further to my elderly father while my husband and I were looking at sites. Also went out of his way to find UA after we left souvenir on his jeep. Highly recommend Steven with dineh. Enjoyed the tour. Even though we could have driven and done the tour on our own signs marked the monuments it would have been rough on our rental van. Nice that our driver didn't have to drive and could enjoy the scenery. The only disappointment was that we were never given history as to where certain movies were filmed and which monuments were in what movie which is what I was hoping to learn. We learned more about the movie aspect at the museum and was looking forward to seeing it. However we did learn a lot about the Navaho culture and their history. Our guide was very nice and answered our questions.